Shop online for 24 plastic model buildings at discounts up to 27%. Pegasus Hobbies is ranked #1 out of 7 plastic model buildings manufacturers, followed by Moebius Models, and Dioramas Plus. This is HO Scale Munster's House Plastic Model Kit from Moebius. Suitable for Ages 15 & Older. 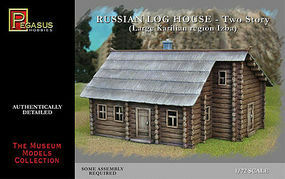 This is the 1/72 Scale Plastic Model Military Diorama Kit of the Russian 2-Story Log House (Snap) by Pegasus Hobbies. Suitable for Ages 8 & Older. 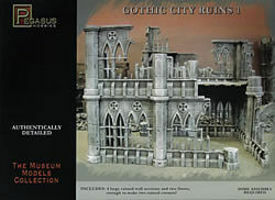 This is the 28MM Scale Plastic Model Building Kit of the Gothic City Building Ruins Set #1 by Pegasus Hobbies. 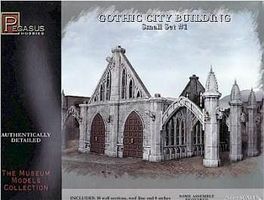 This is the 28MM Scale Plastic Model Building Kit of the Gothic City Building Small Set #1 by Pegasus Hobbies. 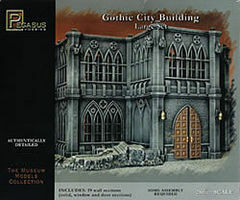 This is the 28MM Scale Plastic Model Building Kit of the Gothic City Building Large Set by Pegasus Hobbies. 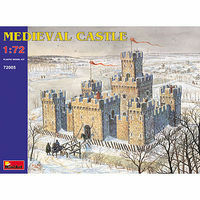 This is the 1/72 Scale Medieval Castle from the Historical Miniatures Series by MiniArt. Suitable for Ages 14 & Up. 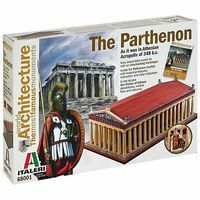 This is The Parthenon from the World Architecture Series by Italeri. Suitable for Ages 14 & Older. 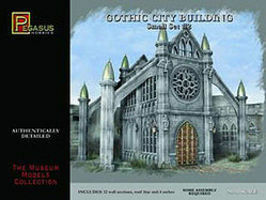 This is the 28MM Scale Plastic Model Building Kit of the Gothic City Building Small Set #2 by Pegasus Hobbies. This is the 1/35 Scale Ruined Small 3-Story Brick Apartment Building (8.5x4.5x12'') Diorama from Dioramas Plus. This is the 1/200 Scale Off-Shore Oilrig North Cormorant Plastic Model Kit by Revell Germany. Suitable for Ages 13 & Older. This is the 1/35 Scale Ruined Small 3-Story Government Building (12x7) Diorama from Dioramas Plus. This is the 1/35 Scale Ruined Concrete/Brick Building (12x9x12'') Diorama from Dioramas Plus. This is the 1/72 Scale Plastic Model Military Diorama of the Russian Izba (Karilian Style) (1) (Painted) by Pegasus Hobbies. Suitable for Ages 8 & Older. This is the 1/72 Scale Plastic Model Military Diorama Kit of the Ukrainian House (1) (Painted) by Pegasus Hobbies. Suitable for Ages 8 & Older. This is the 1/72 Scale La Haye Sainte Barn from the Waterloo 200 Years Series by Italeri. Suitable for Ages 14 & Older. This is the 1/72 Scale Plastic Model Military Diorama Kit of the Ukrainian House (Painted) by Pegasus Hobbies. Suitable for Ages 8 & Older. This is the 1/35 Scale Juno 2-Story Beach House w/Base (8x10.5) Diorama from Dioramas Plus. This is the 1/35 Scale Ruined Large 3-Story Brick Apartment Building (12x8x11'') Diorama from Dioramas Plus. This is the HO Scale Prefinished Munster's House Display Model by Moebius. Suitable for Ages 15 & Older.